At ClassMarker, we get lots of inquiries regarding the white labeling of Tests. Can my exams be 'white labeled' with ClassMarker? Yes. Do I need a website to have my branded Tests on? No, not at all. Organization branding is extremely important for any company. Whether you provide a product or a service, you want your branding placed on these. For whichever reason you are creating Tests, these Tests are also content that you are creating for your customers, in which it is equally important that these have your mark on them as well, not to mention this increases your branding. Here, at ClassMarker, we refer to white labeling online exams as 'Themes'. This is because we allow you to do more than just place a logo on your Test. When you create a theme, you can add background images, logos, you can customize the Test with the colors you choose, you can even customize the colors of the Test next, previous and finish buttons, Test timer and much more. If you create Test Certificates, you can also brand and customize these to match your Tests. Email a link to Test-Takers - you can also post these to social media sites, blogs, into documents such as Word, PDF, etc. Embed an Exam into your website - with using this option, you can not only add your branding but you can hide the ClassMarker URL by embedding the Test into your web pages. Let's take a look at how easy it is for branding exams with ClassMarker. You can upload your company logo, add title text which will display in the browser title bar, select a title text color if you do not provide a logo, choose your header background color that sits at the top of the page, select the header width in which you can set the width to reach across the full screen or to be the same width as the Exam is and center or left align your header logo or header text. 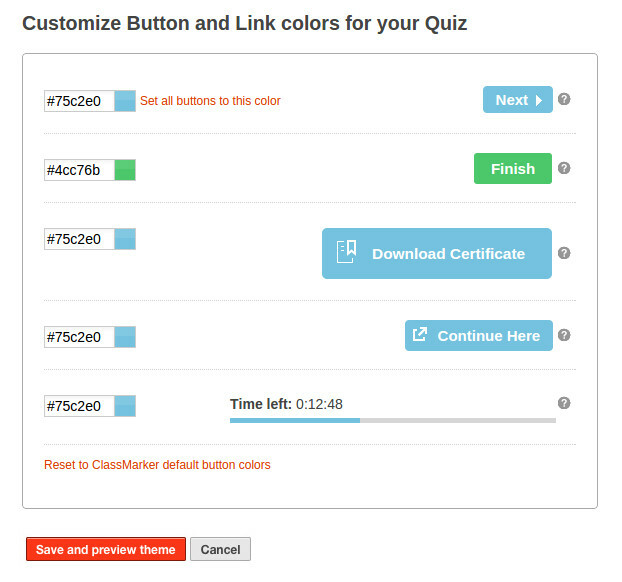 ClassMarker's online quiz maker allows you to quickly add your organization branding to your Quizzes. 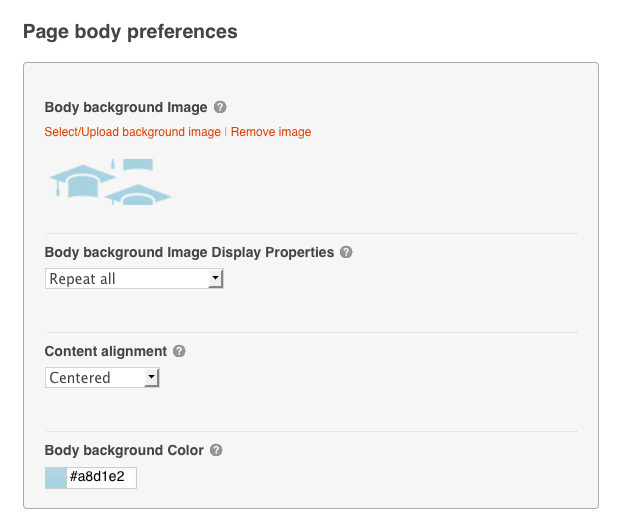 Display a background image or leave blank for no image, choose how to have your background image show with once or to be repeated with the page body background image display properties, choose your content alignment, which is for having your header and quiz display center or left aligned, select your page body background color. You can customize the 'Next' and 'Previous' navigation buttons and standard link colors, choose a different color for the 'Finish' button so it stands out from the other navigation buttons, add color for the 'Certificate Download' button, change the color for the 'Continue Here' button, this is used if you have set a return link to direct users back to your website. 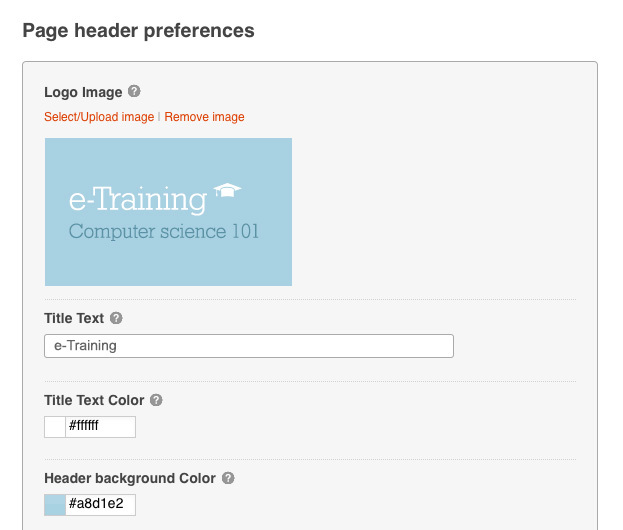 Once you have created your Test theme, you will then be able to save and preview the theme before applying it. If you need to still make changes, simply go back to edit your theme. Did you know that ClassMarker also has a charge for tests feature in which you can apply your company identity to these as well. Make sure your Exams are professionally recognized, using ClassMarker's online assessment platform. If you need any help with creating your themes, please feel free to contact our customer support team, who are always available 24 hours a day, 7 days a week to answer your questions, provide solutions or even just pass along a suggestion as to different ways you are able to customize your Tests.